Household water use swells in the summer due to irrigation of lawns and gardens, but according to the U.S. EPA as much as 50% of the water we use outdoors is wasted from inefficient watering methods and systems. Quell the swell! Conserve Minnesota's limited freshwater resources by using efficient watering methods this summer. Before you even turn on the hose, determine if you even need to water. Trees and native plants do quite well with only rainwater. Except in times of drought, you don't need to irrigate these areas. Consider adding more of these plants to your yard. Find plant suggestions at BlueThumb.org. Grass also does quite well with only rainwater. According to Minnesota Extension, lawn irrigation is optional in Minnesota’s climate. If you choose not to irrigate your lawn, it may be brown for several months. But when the temperature cools in the late summer, the grass will green up and grow again. Garden beds with non-native flowers or vegetables usually need some water in the driest months. Though plants vary, a rule of thumb is to water one inch a week (minus rainfall). Keep track of rain and watering using a rain gauge placed in the garden. Also apply a layer of mulch around plants to reduce evaporation. For the areas you choose to water, use the tips below. In the spring, look for leaks. Check the hose for leaks at its connection to the spigot. If it leaks, replace the nylon or rubber washer and ensure a tight connection to the spigot using pipe tape and a wrench. To check for leaks in an in-ground irrigation system, contact a certified irrigation professional. Water in the early morning. The wee hours of 4-8 a.m. are best for watering. Set up your sprinkler or irrigation system before you go to bed. In the morning, turn on the water while you get ready for the day. 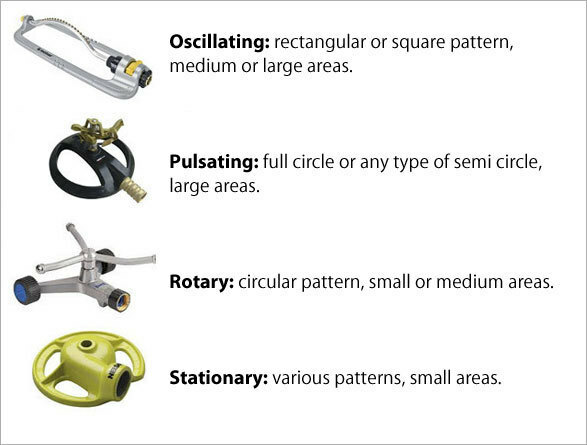 If the morning is too busy to add watering to the list, try a hose timer. When hand watering, use a spray nozzle. A hose can waste 6 gallons per minute if you leave it running. A nozzle will stop the water until you are ready to use it. Install micro irrigation along garden beds, shrubs, and trees. Micro irrigation—such as a soaker hose or drip tape—delivers low volumes of water directly to plants' roots, minimizing the water lost to wind, runoff, and evaporation. Simply run the irrigation hose along a row of plants and leave it there all season. Connect your main hose when you need to water. More complicated systems are available for larger areas. Use a timer. It’s easy to forget that you've turned on the water. A kitchen timer or hose timer can help you. Don't sprinkle the driveway and sidewalk. It helps to select a sprinkler that matches your garden shape and size. Also choose a sprinkler that throws large drops, instead of a misty spray. This will ensure more water reaches plants and less is lost to evaporation and wind. Consider an irrigation system. 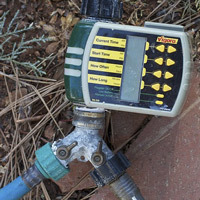 If maintained and properly set with a WaterSense labeled irrigation controller, an irrigation system—including in-ground sprinklers and/or micro irrigation—will water at the ideal time of day, adjust the amount of water according to the soil moisture, and will not keep running if you forget that it is on. An irrigation controller uses local weather and landscape conditions to tailor watering schedules to actual conditions on the site. These can also be added to older, existing systems. Catch the rain. When the rain does come, saving rain water in rain barrels or cisterns is a great way to harvest rain water for irrigation. If the barrel is next to a garden, you can attach a soaker hose to the barrel and simply turn it on to let the water run. Apply to be a Minnesota GreenCorpsmember! Minnesota GreenCorps is an AmeriCorps program run through the Minnesota Pollution Control Agency. Members gain valuable skills and job experience in the environmental field while giving back to the communities in which they serve. Applications for 2013-2014 members are due June 7. Read more on our website. WaterFest 2013 is a free, family-friendly event celebrating clean water. Experience Lake Phalen in a Voyageur canoe, solar pontoon, canoe, or kayak. Enjoy a fishing contest, WCCO’s weather tracking machine, Geocaching, climbing wall, jump castle, native plant give-away, live animals, water games, landscaping, watershed and art exhibits, lakeside yoga, Hmong dancers and lots more, June 1, 11 a.m.-4 p.m., Lake Phalen (St. Paul). Gain a deeper understanding of Minnesota's water resources at a free public lecture about Why the Public Should Care About the Connection Between Groundwater and Lake, Streams and Wetlands. Registration is required, June 6, 7 p.m., U of M Student Center (St. Paul). Between April 1 and June 30, you can take Metro Transit's Commuter Challenge. Just pledge to take the bus or train, bicycle, carpool, walk, telework or vanpool instead of driving alone. Participants will be entered into a prize drawing, in addition to the health, financial and environmental benefits of taking alternative transit. Attention youth entering grades 4-12! The Will Steger Foundation and Minnesota Pollution Control Agency are sponsoring the Youth Voices of Change: Climate Change Video Competition. To participate, just create a video that shows how how you are engaging in solutions to climate change in your home, school or community. Videos are due by July 15, 2013. Ten finalist videos will be chosen and the competition winners will be announced the evening of August 23, 2013 on the Sustainability Stage at the Eco Experience at the State Fair.